The future of transportation just got a bit murkier: Uber is teaming up with Lime to rent scooters through its app as part of a $335 million financing deal. The scooters will sport Uber’s logo and be available for rental through the Uber app. 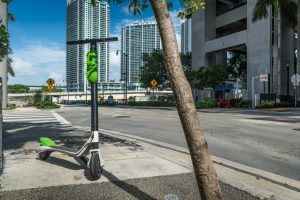 Lime scooters are available in about 70 cities worldwide in much the same manner as dockless bikes: users reserve and scoot and then leave the vehicles on the sidewalk for their next users. Uber filed an application to launch its own scooter-sharing company in San Francisco awhile ago, so this deal raises questions about those plans and what scooters might do to Uber’s ride-sharing services in dense cities.